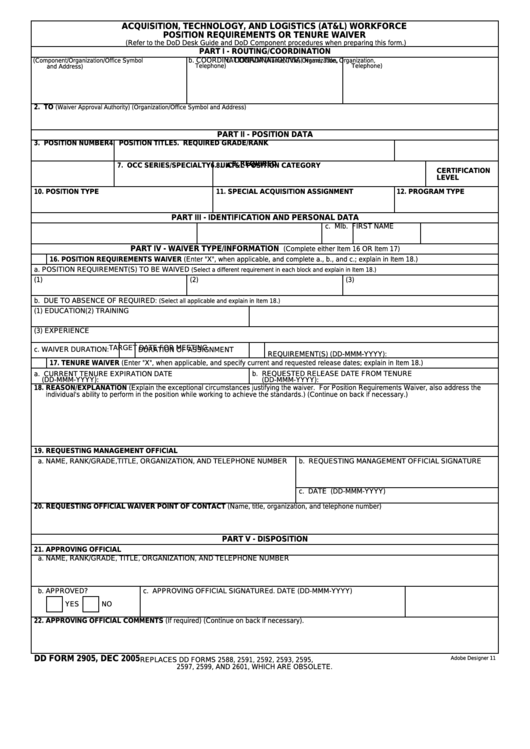 Download a blank fillable Dd Form 2905 - At&l Workforce Position Requirements Or Tenure Waiver in PDF format just by clicking the "DOWNLOAD PDF" button. Complete Dd Form 2905 - At&l Workforce Position Requirements Or Tenure Waiver with your personal data - all interactive fields are highlighted in places where you should type, access drop-down lists or select multiple-choice options. 22. APPROVING OFFICIAL COMMENTS (If required) (Continue on back if necessary). 2597, 2599, AND 2601, WHICH ARE OBSOLETE.